The Ekstraklasa (Polish pronunciation: [ˌɛkstraˈklasa]), named Lotto Ekstraklasa since the 2016–17 season due to its sponsorship by Lotto [pl], is the top Polish professional league for men's association football teams (it is the country's primary football competition). The winner of the Ekstraklasa claims the Polish national championship. Contested by 16 clubs, operating a system of promotion and relegation with the I liga, seasons start in July, and end in May or June the following year. Teams play a total of 37 games each, totalling 296 matches in the season. Games are played on Fridays, Saturdays, Sundays and Mondays. The winner of the Ekstraklasa qualifies for the Polish SuperCup. The Ekstraklasa is now operated by the Ekstraklasa SA (English: Ekstraklasa Joint-stock company). The Ekstraklasa (former I liga) was officially formed as Liga Polska on 4–5 December 1926 in Warsaw, since 1 March 1927 as Liga Piłki Nożnej (Polish pronunciation: [ˈlʲiɡa ˈpiwki ˈnɔʐnɛj]), but the Polish Football Association (Polish: Polski Związek Piłki Nożnej, PZPN) had been in existence since 20 December 1919, a year after the independence of Poland in 1918. The first games of the freshly created league took place on 3 April 1927, while first national non-league football championship took place in 1920. A total of 81 teams have played in the top division of Polish football since the founding of the league, of which 16 clubs have won the title. The current champions are Legia Warsaw, who won their thirteenth title in 2017–18 season. On 4–5 December 1926 in Warsaw, representatives from several Polish clubs met for the purpose of discussing the creation of a league. It is unknown where the idea of a Polish league originated from, however a national league was thought to be a much more practical solution than hitherto practiced two-stage system of regional matches followed by a national match. To dismay of clubs' officials, the PZPN was not receptive to the idea of a national league and therefore sought to thwart it. However, it turned out that virtually all but one of the Polish clubs supported the idea. The decision to create it was made regardless what PZPN's representatives thought of it. In late February 1927, at the PZPN's meeting in Warsaw, its officials openly opposed the formation of a league, but the clubs, allegedly egged on by some generals from the Polish Army (which, after May Coup of 1926, played a key role in all aspects of public life), proceeded anyway. The creation of the League was announced on 1 March 1927. The only opponent of the league's formation was Cracovia – a very influential and strong organization in Polish football of the 1920s. Cracovia's boycott was because its chairman, Dr. Edward Cetnarowski, at the same time held the post of the director of the PZPN. Cetnarowski was a personality known not only in Poland, but also in other countries. It was due to his efforts that in September 1923, Cracovia toured Spain, drawing 1–1 with Barcelona and losing 0–1 to Real Madrid. In October, also thanks to Cetnarowski, Sevilla travelled to Kraków, losing 2–3 to Cracovia. 1927 Winning Wisła Kraków side. In this first season of the league, fight for championship was decided between two powerful teams – Wisła Kraków and 1.FC Katowice. This rivalry was treated very seriously, not only by the two sides involved, but also by the whole nation. 1.FC was regarded as the team supported by German minority, while Wisła, at the end of this historic season, represented ambitions of all Poles. Some time in the fall of 1927 in Katowice, an ill-fated game between 1.FC and Wisła took place. Stakes were very high – the winner would become the champion. Kraków's side won 2–0 and became the champion. 1.FC finished second, third was Warta Poznań. In 1928 Cracovia finally decided to enter the league, which was gladly accepted by all fans of football. However, championships were once again won by Wisła, with such excellent players as Henryk Reyman, Mieczyslaw Balcer and Jan Kotlarczyk. Warta Poznań was second and Legia Warsaw third. This was also the last year of 1.FC's glory. The team finished fifth, to be relegated forever at the end of 1929 season. In 1929 yet another team (after Cracovia, Pogon Lwów and Wisła) was added to the list of champions of Poland. This time it was Warta Poznań, which finished one point ahead of Garbarnia Kraków. However, after the last game, on 1 December 1929, it was Garbarnia Kraków that was celebrating the championship. Two weeks later, in mid-December, PZPN's officials changed the result of the Warta – Klub Turystow Łódź game. Originally, Warta lost 1–2, but due to walk-over (it was decided that one of Łódź's players did not have all necessary documents), this was changed to 3–0 in favor of Poznań's side. As a result of the decision, Warta (with 33 points) became the champion, Garbarnia finished second with 32 points and Klub Turystow was relegated. In 1930, Cracovia regained the championship, (to repeat this success in 1932) and a year later another Kraków's side, Garbarnia, won the league. It is clear that the 1927–1932 period was marked by dominance of teams from Kraków. During this time, only once (Warta Poznań, 1929) the championship was won by a side from a different city. The 1931 champion, Garbarnia, was unique as this was the first time that the league had been won by a side whose all players had been bought from other teams. As has been said, the early 1930s marked a decline of the dominance of Kraków and Lwów as centers of Polish football. The point of gravity slowly moved towards west – to Polish part of Upper Silesia, which had belonged to Poland since 1921 (see: Silesian Uprisings). In 1932 the champion was Cracovia, but starting in 1933, Ruch Chorzów (then: Ruch Wielkie Hajduki) completely dominated the league, being the champion for four times in a row. Ruch, with such excellent players as Teodor Peterek, Ernest Wilimowski and Gerard Wodarz was by far the best team in those years. For example, in 1934 it finished seven points ahead of second Cracovia. Other important teams of these years were: Cracovia, Wisła Kraków, Pogoń Lwów and Warta Poznań. In 1933 and 1934 there were 12 teams in the League. In 1935 this number was cut to 11 and in 1936 – to 10. Football officials did it on purpose – with fewer teams, the competition was supposed to be harder, which would attract fans to the stadiums. However, supporters' turnout was not impressive, with Ruch Chorzów as the most popular team, both at home and away. In late 1935 (the league held its games in the spring-summer-fall system) fans were shocked to find that Cracovia, the legend of this sport, was relegated to the A-class. Kraków's side absence lasted for a year – it returned in 1937, to become the champion. Ruch Chorzów was still the dominant team, winning the Championships in 1936 and 1938. In 1937 Ruch's streak of four consecutive champions was broken by Cracovia, and in 1939 the championships were not finished. By 31 August 1939, after some 12 games, Ruch was the leader of the 10-team League. Last games of this summer occurred on 20 August. Then, a break was planned, because the National Team was going to play a few international friendlies. Games were to be re-introduced on 10 September. As a result of the Second World War, the borders of Poland changed significantly. Lwów, one of the centers of Polish football (with such teams as Pogoń Lwów, Czarni Lwów and Lechia Lwów) was annexed by Soviet Union and all these teams ceased to exist. Lwów's football officials and players moved westwards, creating such clubs as Polonia Bytom, Odra Opole and Pogoń Szczecin (see: Recovered Territories). Another important center, Wilno (with the team Śmigły Wilno), was also annexed by the Soviets (see: Polish areas annexed by the Soviet Union). 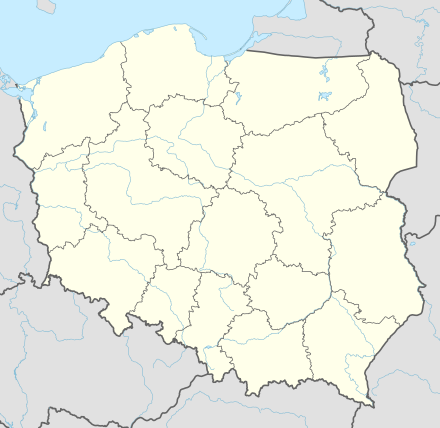 In exchange, Poland gained a large swath of formerly German territory in particular in Silesia, with its capital Wrocław (home of double champion Śląsk Wrocław) and towns such as Zabrze (home of 14-times champion Górnik Zabrze, Bytom (home of champions Polonia Bytom and Szombierki Bytom) and Lubin (home of double champion Zagłębie Lubin). 18 teams played in the league between seasons of 1992 and 1998. There are 16 clubs in the Ekstraklasa. During the course of the season each club plays the others twice, once at their home stadium and once at that of their opponents, for a total of 30 games (240 games in the season). From the 2013–14 season onward after 30th round league will be split into 'champion' (top eight teams) and 'relegation' (bottom eight teams) groups. Each team plays seven more games (teams ranked 1–4 and 9–12 play four times at home). The 2016–17 season was last when teams started an extra round with half the points (rounded up) achieved during the first phase of 30 matches. The changes extend the season to total of 296 matches played. Location of teams in 2018–19 season. Abandoned due to the outbreak of World War II. On 31 August 1939 Ruch Chorzów was the leader. The following table lists the league champions by the Polish voivodeship regions (current, valid since 1999). After 10 Polish Championship titles a representative Golden Star is placed above the team's badge to indicate 10 Polish Championship titles. The all-time league table consists off all the teams that once participated in the Ekstraklasa. Data from the 1927 – 2016–17 seasons. From 1927 to 2017 a total of 81 teams contested in the Ekstraklasa. Bold- indicates teams currently playing in the Ekstraklasa 2017–18 season. 1. An equal number of points on the basis of their goal difference, then greater number of goals scored. 2. In seasons 1927 – 1994–95 for a win awarded 2 points and 1 point for a draw. In seasons 1986–87 – 1989–90 for win at least three goals difference additionally awarded 1 point, while a losses at least 3 goals difference subtracted one point. Since the season 1995–96 for win gives 3 points and 1 point for a draw. 3. Included additional qualification games between both teams and league championship and remain in the league (including 11 games in 1948, 1986–87, 1987–88, 1988–89) and was not included in the table play-off for the right to play in the league between teams of different class divisions. 4. Included matches with unfinished 1939 season. In the season 1934 in the meeting Garbarnia Kraków – ŁKS Łódź held bilateral forfeit 0:3 (match did not take place due to the fault of both teams). Matches of the season 1986–87 (Lech Poznań – Polonia Bytom 1:1, Olimpia Poznań – Stal Mielec 1:3, Zagłębie Lubin – Ruch Chorzów 0:2) and the season 1992–93 (Wisła Kraków – Legia Warsaw 0:6, ŁKS Łódź – Olimpia Poznań 7:1 ) on suspicion settings results have been verified as completed, but the teams received points places and infield (and this is included in the table). In the season 1993–94 Legia Warsaw, Wisła Kraków and ŁKS Łódź started the game with a negative account (−3 points) as punishment for the events of the final round of the season 1992–93. In the season 2009–10 Jagiellonia Białystok was penalized 10 points deduction for participating in the corruption scandal. In the season 2012–13 Zagłębie Lubin was penalized 3 points for participating in the corruption scandal. In the season 2015–16 Wisła Kraków, Górnik Zabrze, Lechia Gdańsk and Ruch Chorzów were penalized 1 points for failing with licensing requirements. In the season 2016–17 Ruch Chorzów waw penalized 4 points for failing with licensing requirements. The combination Union Łódź and Klub Turystów Łódź at Union-Touring Łódź (1932) – the balance Klub Turystów and Union-Touring counted together. The combination Rymer Niedobczyce and Błyskawica Radlin at Górnik Radlin (1949) – the balance Rymer and Górnik counted together. The combination Sokół Pniewy and GKS Tychy at Sokół Tychy (1995) – the balance of the Sokół Pniewy and Sokół Tychy is counted together. The combination Olimpia Poznań and Lechia Gdańsk at Lechia/Olimpia Gdańsk (1995) – the balance Lechia/Olimpia Gdańsk is included in the balance sheet Lechia Gdańsk. The combination Amica Wronki and Lech Poznań (2006) – Lech Poznań balance before and after the merger is counted together. The combination Dyskobolia Grodzisk Wielkopolski and Polonia Warsaw (2008) – Polonia Warsaw balance before and after the merger is counted together. Zagłębie Sosnowiec – at the end of 2007/08 they were relegated from the top division to the 3rd, as they finished the season in the relegation zone, plus one division lower due to corruption. Korona Kielce – at the end of 2007/08 they were relegated one level lower due to corruption. Zagłębie Lubin (Polish champion 2006–2007) – at the end of 2007/08 they were relegated one level lower due to corruption. The following data indicates Polish coefficient rankings between European football leagues. All matches from the 2011–2012 season are telecast live nationally by Canal+ Poland. Telewizja Polska has the rights to air live 1 games per week on a non-scrambled channel. Since 2015–2016 season nc+ will broadcast 6 games a week and Eurosport 2 will broadcast one Friday game and Monday match. Both channels will get their own league magazine. From 17 August 2012, Sports Tonight Live in the United Kingdom began to air live Ekstraklasa matches three times a week. ^ "History". Polish Football Association. Archived from the original on 20 January 2015. Retrieved 2 January 2015. ^ "LOTTO Partnerem Tytularnym Ekstraklasy". www.ekstraklasa.org. 14 July 2016. Archived from the original on 18 July 2016. Retrieved 15 July 2016. ^ "History". wisla.krakow.pl. Archived from the original on 14 September 2011. Retrieved 3 October 2011. ^ "Polish Football is Coming to Sports Tonight". YouTube. Archived from the original on 20 July 2012. Retrieved 20 July 2011.